Towering above ancient Dion, about 48 miles (77km) south of Thessaloniki, is Greece's highest mountain, Mount Olympus, home to some of the famed Gods of Greek mythology. Olympus was the residence of the divine family, the twelve most important ruling gods and goddesses of ancient Greece, who therefore were called the Olympians. Olympus was not heaven but a dwelling place of the gods. The mountain is rich in tree and plant life, supporting more than 1,700 species, some very rare, and it is part of a National Park and a World's Biosphere Reserve. The main village in the area is Litohoro, which is connected to Athens and Thessaloniki by bus and train, and has been nicknamed the 'City of Gods' due to its location beneath the mountain. It is possible to climb the highest peak in about two days, and almost the whole hike is non-technical and can be done without experience or special equipment, along numerous mountain trails. 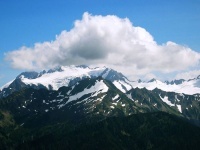 However, the final ascent to the summit of Mytikas, the highest of Mount Olympus's 52 peaks, is a class 3 rock scramble and requires some skill and experience. About 10,000 people climb the mountain every year but most only reach the Skolio summit. Hikers generally set out from Litochoro.